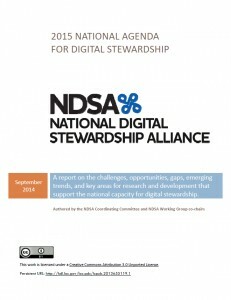 The National Digital Stewardship Alliance is pleased to announce the release today of the “2015 National Agenda for Digital Stewardship.” The Agenda provides funders, decision‐makers and practitioners with insight into emerging technological trends, gaps in digital stewardship capacity and key areas for research and development to support the work needed to ensure that today’s valuable digital content remains accessible, useful, and comprehensible in the future, supporting a thriving economy, a robust democracy and a rich cultural heritage. The 2015 National Agenda is the result of many months of individual effort and dedicated institutional support from across the NDSA community and it integrates the perspective of leading government, academic, nonprofit and private-sector organizations with digital stewardship responsibilities. This year’s Agenda builds on the foundations of the 2014 Agenda (PDF) and outlines the challenges and opportunities related to digital preservation activities in four broad areas: Key Issues in Digital Collection Building; Organizational Policies and Practices; Technical Infrastructure Development; and Research Priorities. Each section articulates priorities then offers a set of actionable recommendations to address the challenges. A theme running through the Agenda is that while there is more content being created than ever, there’s also increasing recognition by businesses, research institutions, policymakers and funders that legacy digital content contributes to positive job creation and international competitive advantage. At the same time, digital stewardship processes are reaching a critical mass of maturity and uptake, and more work is being done to steward digital content than ever before. The Agenda addresses both of these trends and attempts to make sense of the changing landscape and articulate the priority actions that will have the most impact on community and practice. Much of the investment and effort in the field of digital preservation has been focused on developing technical infrastructure, networks of partnerships, education and training, and establishing standards and practices. Little has been invested in understanding how the stewardship community will coordinate the acquisition and management of born‐digital materials in a systematic and public way. Build the evidence base for evaluating at‐risk, large‐scale digital content for acquisition. Develop contextual knowledge about born‐digital content areas that characterizes the risks and efforts to ensure durable access to them. Understand the technical implications of acquiring large‐scale digital content. Extend systematic surveys and environmental scans of organizational capacity and preservation storage practices to help guide selection decisions. Share information about what content is being collected and what level of access is provided. Communicate and coordinate collection priority statements at national, regional and institutional levels. Support partnerships, donations and agreements with creators, owners and stewards of digital content. Connect with digital content creation communities across commercial, nonprofit, private and public sectors to leverage their incentives to preserve. Advocate for resources. Share strategies and develop unified messages to advocate for funding and resources; share cost information and models; and develop tools and strategies that inform the evaluation and management of digital collection value and usage. Enhance staffing and training. Explore and expand models of support that provide interdisciplinary and practical experiences for emerging professionals and apply those models to programs for established professionals. Evaluate and articulate both the broad mix of roles and the specialized set of skills in which digital stewardship professionals are involved. Foster multi‐institutional collaboration. Foster collaboration through open source software development; information sharing on staffing and resources; coordination on content selection and engagement with the development of standards and practices; and identify, understand and connect with stakeholders outside of the cultural heritage sector. Coordinate and sustain an ecosystem of shared services. Better identify and implement processes to maintain key software platforms, tools and services; identify technologies which integrate well to form a sustainable digital workflow; and identify better models to support long‐term sustainability for common goods. Foster best practice development. Give priority to the development of standards and best practices, especially in the areas of format migration and long‐term data integrity. Build the evidence base for digital preservation. Give priority to programs that systematically contribute to the overall cumulative evidence base for digital preservation practice and resulting outcomes–including supporting test beds for systematic comparison of preservation practices. Better integrate research and practice. Give priority to programs that rigorously integrate research and practice or that increase the scalability of digital stewardship. The 2015 Agenda is designed as a catalyst to action for legislators, funders, decision-makers and practitioners. The NDSA will support the release of the Agenda with outreach and education events across the country over the course of the next year, while diving deeper into questions posed by the Agenda with research papers to address particular issues, such as file fixity. Download the full report and the executive summary at http://www.digitalpreservation.gov/ndsa/nationalagenda/index.html. Founded in 2010, the NDSA is a consortium of over 150 member institutions committed to the long-term preservation and stewardship of digital information. NDSA member institutions come from all sectors, and include universities, consortia, professional societies, commercial business, professional associations, and government agencies at the federal, state, and local level. Further information about the NDSA can be found at http://NDSA.org. This is a syndicated post. Read the original at The Signal: Digital Preservation 2014-10-01. ← Overhyped and concentrated investments in research funding are leading to unsustainable science bubbles.